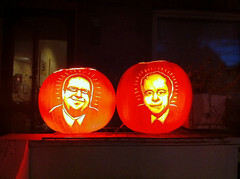 We saw Penn & Teller for the first time in Vegas this past August, and because we also had tickets to their Toronto show in November they were on my mind when I was trying to decide what to carve for this year’s pumpkin. Of course the project called for two this year, and my task was further complicated by having chosen slightly smaller than usual pumpkins, which forced me to operate at (or perhaps slightly beyond) the limit of my skills. The end result however, when illuminated by household compact fluorescents and viewed from a respectable distance, ended up looking somewhat… respectable. We tweeted the results on flickr to the subjects, one of whom retweeted the link to his followers, resulting in a hit count which is bound to surpass all previous views on my entire catalogue.